In an updated meta-analysis, an international team of reviewers found vitamin D supplementation did not improve multiple sclerosis relapses or disability progression. Nor did it reduce the number of lesions on magnetic resonance imaging. Supplementation with vitamin D has no apparent effect on relevant clinical outcomes or new magnetic resonance imaging (MRI) lesions associated with multiple sclerosis (MS), irrespective of the form or dose used, according to a new systematic review published in the September 24, 2018 Cochrane Library. “Moreover, short-term trials have provided scanty and poorly reported safety data and have not provided evidence that can be used to determine a reliable risk profile for vitamin D supplementation. Conservative interpretation of these results is warranted because vitamin D has been evaluated in trials providing low- to very low-quality evidence,” lead investigator Vanitha Jagannath, MD, a specialist pediatrician in the department of pediatrics at the American Mission Hospital in Manama, Bahrain, told Neurology Today in an email. The 2018 published review was an update of the 2010 Cochrane systematic review on vitamin D supplementation in people with MS. “The previous review included only one study, which concluded that high doses of vitamin D are safe and well tolerated, and did not have any suggestions on other outcomes,” said Dr. Jagannath. Dr. Jagannath and an international team of reviewers examined whether vitamin D supplementation improves recurrence of relapse and progression of disability or decreases the number of lesions observed by MRI. The reviewers assessed all the available randomized control trials (RCTs) with the intervention using the Cochrane protocol to obtain evidence. They assessed their confidence in the quality of evidence using the Cochrane's Grading of Recommendations, Assessment, Development and Evaluation (GRADE). The rating categories are high, moderate, low, and very low based on five factors: imprecision, indirectness, inconsistency, limitations in design and execution, and publication bias. The reviewers identified 12 RCTs with a total enrollment of 933 adult participants with data published between 2010 and 2017. Participants had a diagnosis of MS based on the diagnostic criteria of Schumacher, Poser, or McDonald, and all subgroups of MS were included. A total of 464 participants were randomized to the vitamin D group, and a total of 469 participants to the comparison group consisting of placebo, low doses of vitamin D, or routine care. Eleven trials tested vitamin D3, and one trial tested vitamin D2. The primary clinical outcome measures of vitamin D supplementation were annualized relapse rates (ARR), changes in Expanded Disability Status Scale (EDSS) scores, and mean changes in MRI parameters of disease activity, including new lesions on T2-weighted images, pre-existing lesions enlarged on T2-weighted images, or gadolinium-enhancing lesions in T1-weighted images. Five RCTs with 418 participants assessed ARR over the 52 weeks from randomization. The results showed that vitamin D supplements had no clear effect on reducing ARR in participants with MS who were receiving disease-modifying drugs such as glatiramer and natalizumab, said Dr. Jagannath. Five RCTs with 221 participants assessed disease progression using changes in the EDSS scores. The data over 52 weeks from randomization showed that vitamin D supplements were ineffective in preventing worsening of disability. “The reviewers graded their confidence in the quality of the ARR and EDSS results as very low due to risks of bias and imprecision,” said Dr. Jagannath. Only four studies with 336 participants provided information on the effects of vitamin D on MRI gadolinium-enhancing T1 lesions for 26 weeks or 52 weeks. The results showed no effect on the reduction of the lesions compared with placebo at both time intervals. The confidence level again was very low due to selection bias and imprecision, said Dr. Jagannath. The reviewers also reported that the effects of vitamin D were uncertain on health-related quality of life and fatigue. None of the 12 studies reported data on two primary outcomes: numbers of participants experiencing changes in EDSS score and time to first treated relapse. Although eight studies with 621 participants reported a lack of serious adverse events, the reviewers graded the quality of evidence as low certainty. The results of the report were not surprising to researchers looking at the role of vitamin D in MS, said Alberto Ascherio, MD, DrPH, professor of epidemiology and nutrition at Harvard's T.H. Chan School of Public Health, who was not involved in the review. The limitations listed in the review ranged from short duration to problems with comparison groups including no placebo and, in some studies, relatively high doses (14,000 IU per day or more) of vitamin D.
Of the nine trials that reported the baseline vitamin D status of participants based on serum 25-hydroxyvitamin D levels, only three trials had substantial proportions of participants with insufficient vitamin D levels (<50 nm/L), in spite of the fact that vitamin D insufficiency is highly prevalent among persons with MS in many countries. For comparison groups, six trials used placebo, four trials used high versus low doses of vitamin D, one trial used arachis oil, and another one provided routine care. In the meantime, he recommends that patients with MS take 3,000 IUs of oral vitamin D3 daily based on sufficient evidence such as the Finnish trial in the systematic review, which prescribed 20,000 IUs weekly. “The current analysis doesn't significantly change what we knew about vitamin D and its therapeutic effect on MS. Nonetheless, the authors highlight the considerable research that has been done demonstrating the effect of vitamin D on risks and activity levels of MS,” said Daniel Ontaneda, MD, MSc, staff neurologist and assistant professor of medicine and neurology at Cleveland Clinic Lerner College of Medicine. To overcome those challenges, some researchers have proposed trials that randomize patients to vitamin D target levels instead of doses. “But, how frequently would they check vitamin D levels, which can vary daily? There also has been a lack of consensus among researchers about what form of vitamin D to use (D2 or D3), what the optimal dose should be, or whether randomization should be to a higher or lower dose or placebo,” said Dr. Ontaneda. He was optimistic, though, that well-planned studies with a sufficiently large sample sizes and follow up can overcome some of these issues. “Well powered RCTs are expensive but they are likely a worthwhile investment to answer questions related to the efficacy of vitamin D. Large high-quality observational studies may also provide some insight into efficacy and may help create consensus on study design,” said Dr. Ontaneda. •. Jagannath VA, Filippini G, Di Pietrantonj C, et al Vitamin D for the management of multiple sclerosis https://www.cochrane.org/CD008422/MS_vitamin-d-management-multiple-sclerosis. Cochrane Database Syst Rev 2018; (9): CD008422. •. Jagannath VA, Fedorowicz Z, Asokan GV, et al Vitamin D for the management of multiple sclerosis https://www.cochranelibrary.com/cdsr/doi/10.1002/14651858.CD008422.pub2/epdf/full. Cochrane Database Syst Rev 2010;(12):CD008422. •. Soilu-Hanninen M, Aivo J, Lindstrom BM, et al A randomised, double blind, placebo controlled trial with vitamin D3 as an add on treatment to interferon beta-1b in patients with multiple sclerosis https://jnnp.bmj.com/content/83/5/565.long. J Neurol Neurosurg Psychiatry 2012;83(5):565–571. 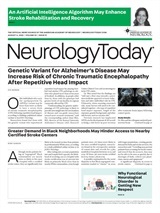 Neurology Today18(22):34-36, November 15, 2018.